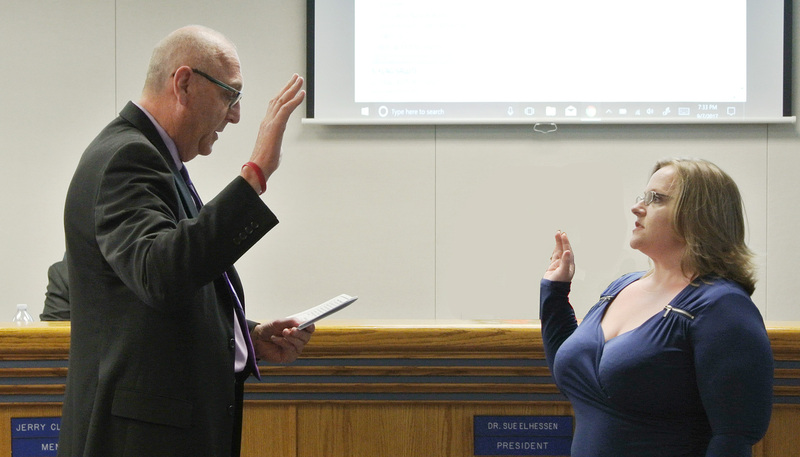 BELLFLOWER – Bellflower resident Hannah Flanagan-Flores was sworn in Sept. 7 as the newest member of the Bellflower Unified Board of Education, replacing retired board member Dr. Paul Helzer. Ms. Flanagan-Flores has served on the PTA Council and the Measure BB Citizens Oversight Committee, and has been a parent advisory member. She is a graduate of California State University, Los Angeles, and holds a Bachelor of Arts in sociology with a minor in law. She works in communications as an outreach associate. Bellflower Unified’s Board of Education decided to make the provisional appointment after the July retirement of Dr. Paul Helzer, who has served on the board for 16 years. Board members interviewed five applicants during a public session on Aug. 31 before choosing Flanagan-Flores. Ms. Flanagan-Flores joins Dr. ElHessen, Jerry Cleveland, Debbie Cuadros and Laura Sanchez-Ramirez on the governing board. Her term will run through the November 2018 election. Bellflower resident Hannah Flanagan-Flores was sworn in on Sept. 7 as a member of the Bellflower Unified School District Board of Education by Superintendent Dr. Brian Jacobs.